Hotels in Adelaide : sahotels.com.au : Find Adelaide's Hotels fast! Hotels in Adelaide : sahotels.com.au : Find Adelaide's Hotels fast! NEVER LET THE FACTS GET IN THE WAY OF A GOOD STUNT? We have not always agreed with the policies the two major parties – yet they have never excluded hotels from expressing their views or advocating their position. The same cannot be said for the leader of the SA Best Party. Nick Xenophon has deliberately used the media to taunt industry, and he has made his intention even clearer – to do great damage to hotels and clubs with gaming machines. He uses stunts to capture headlines and makes all manner of outrageous claims to capture votes. So on the eve of the most important election for decades, let’s revisit many of the claims and myths put by Nick Xenophon and the like. Spending on gaming has been consistently falling for a decade. Net Gaming Revenue has fallen by 32% in real terms in the last 10 years. Expenditure on gaming machines in 2018 is now at 2002/03 levels. That’s 15 years ago! Wiping out gaming would result in a government tax ‘black hole’ equivalent to putting some 3,000 teachers or nurses out of work. (Channel Ten News 9 January 2018). The State Government’s forward estimates have budgeted for tax income from gaming machines of $1,126 Billion over the next four years. According to the SA Office of Problem Gambling Prevalence Study of 2012, fewer than .6% of the SA adult population has a gambling problem (all forms of gambling). This is lower than illicit drug, prescription medicine addiction and over-eating disorders. 26,250 have jobs in pubs. Many more are employed to service the industry, ranging from wineries to tradies. In fact, SA hotels purchased over $1.23 billion in locally supplied liquor, beverages and food last year. Unnecessary changes being proposed by vote-seeking politicians will place thousands of livelihoods at risk. Hotels employ 26,000 people with direct employment. Banning gaming machines or drastically reducing bet sizes in hotels will mean massive job losses and will see many smaller venues ceasing to trade. The most vulnerable workers– Uni students and return-to-work mums – will be hardest hit. Banks will foreclose on loans immediately, not waiting for six to eight years. 84% of all live music gigs are in SA hotels. More than 80% of those live music hotels have gaming machines. Hotels are keeping live music afloat. The term ‘Baron’ is a cynical political strategy to deliberately demonise a sector of the business community for political gain. The facts are that 87% of SA hotels are family and SME based. In 2017, many hotels ceased operation due to economic hardship. These were predominantly regional and country. The number of hotels in SA continues to fall each year. South Australia is one of the smallest gaming States yet leads the Nation in terms of innovative and co-operative responses to managing problem gambling. Be it the best practice response of Gaming Care and Club Safe – Industry funded bodies that work with venues, management and staff and the help agencies to get the best outcome for those that do have gambling problems, or the voluntary contributions made by Hotels and Clubs to the Gamblers Rehabilitation Fund outside of the tax system. Of course the reality is much calls for ‘reform’ are driven by political ambitions not factual research. Take the transition from maximum $10 bets to $5 from January 2017. Did it work, was there a reduction in problem gambler expenditure or participation, was there a marked improvement in people seeking help? We don’t know because no research was done – before or after! To the current day no such systematic research has been undertaken and even those who advocate vigorously for $1 bet limits admit that the research underpinning their argument is largely circumstantial and relatively limited, relying on now aging analyses from the PC. The Industry deserves more than circumstantial and limited evidence. It deserves much more than glib responses and smart aleck stunts. It deserves proper analysis and evidence based responses. There is too much at stake for the State. A vote for Nick Xenophon’s SA Best is a vote for chaos, dysfunction and further regression for South Australia. Go to www.nowaynick.com.au to make your own assessment of the claims being made. In May this year Shayne and Jill White will notch up their 28th year at the helm of the Arab Steed. Tucked away in the southeastern corner of the city, the Arab is a pub that has stood the test of time and it's owners put it down to knowing their place. "You are what you are and we don't pretend to be anything we're not," says Jill. Although the establishment was built on strong foundations in 1849 when it first opened, the fundamental basis of their success has been their commitment to food and good service. The Arab is one of the few pubs that has been able to achieve regular business without completely revolutionising their menu. While it features favourites it is constantly being tweaked to keep to keep it fresh and up to date. It has been a long journey for the Whites from where they began. "When we arrived in 1987 the Hotel was not doing any food, so there was only one way for it to go," says Jill. "So we immediately introduced food. There wasn't even a commercial kitchen here." "And they were the days when you had a very strong food trade due to lack of competition. There was only one cafe in Rundle St and Hutt St did not have any at all, so that's where the food trade really began and it was very good in the early days and still is." "We've been known for consistent, good quality food over the years and that is what brings people in." Despite being known as one of the city's favourite dining hotels, Jill is quick to reiterate that with good food must come good service. "Service is our number one priority and it has been since the day we opened the doors," she says. "You can have the best food in the world, the best renovation in the world, but if you do not have consistently good service, people will not come back." While commitment to quality and service remain unchanged, the hotel itself has undergone regular updates beginning on their arrival in 1987. Recently they have done a major renovation of the bottle shop, Hutt St Cellars, which comes off the back of a sizeable overhaul of the hotel interior four years ago. While big chains like Dan Murphy's, and BWS have dominated the market in recent years, the plan for Hutt St Cellars is to tap into a niche market. "We sell a lot of wine here," says Shayne." "So with our bottle shop we're really trying to be a point of difference. We're not a chain and our service in the bottle shop is of a high standard. Mark the manager has been with us for 13 years. Sean and Sam have also been with us for a long time. They have a wealth of knowledge between them." Another point of difference which the Arab is famous for is their traditional and comfortable appeal, something Shayne believes sets them apart from other city hotels. "Number one we are family owned and we are here. There aren't many places you can walk into anymore and see the publican, there's always a family member here," he says. "Our attraction is we're a comfortable place that you can get a good feed and good service." "The day may well come that a big change is needed but for now we don't feel the need to change a lot, we build and tweak as we go along and that's what works for us. One issue they do face on a regular basis at their Hutt St location is parking. With the street expanding over the years with new businesses and apartments buildings moving in, finding a place to park has become increasingly difficult. The impact of this is most felt in the bottle shop and gaming room where finding a park is a necessity for customers and it is easy for them to drive to the next pub if they cannot find one. Despite this, Jill and Shayne are optimistic about the future of their beloved hotel and are confident they have a loyal customer base. "We've identified that we need to market to customers who live in apartments nearby, says Jill." "Customers that do not mind walking or even riding their bike, rather than trying to attract people that have to find a car park." "Hutt St has taken a long time to mature, it has been quite slow, but in the last 5-10 years it has developed into a cosmopolitan street with a wonderful village atmosphere." "The residential move into the city is something that has changed as well and we are adapting to that." The Stirling Hotel in the Adelaide Hills has been awarded the honour of being named South Australia’s Best Overall Hotel in 2015 at this year’s AHA|SA Hotel Industry Awards for Excellence. 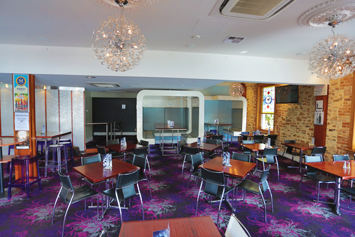 Since its renovation in 2008, The Stirling Hotel has taken out a total of nine awards across all of its major departments, including its accommodation, bistro, retail outlet, functions and restaurant. This year is no exception, with The Stirling Hotel winning the category of Best Restaurant (joint winner with 2KW). food, beverage and service excellence,” said AHA|SA General Manager Ian Horne. “The Stirling Hotel is constantly evolving to suit the needs of the consumer. An outstanding and very popular venue with a very high standard across all of its major facets, it is a clear standout and very worthy of this important recognition”. This year saw the introduction of a new category for Best Small Venue, which acknowledges the quality and popularity of this growing venue type. Clever Little Tailor on Peel Street has won this award, being recognized for its stylish interiors and charming atmosphere, knowledgeable and friendly bar staff, and impressive range of wines, beer and spirits. It was a successful night for the RD Jones Group with their recently redeveloped hotels, The Moseley and The Gully Public House & Garden, both winning multiple awards. Highlighting the value in being progressive and evolving to meet changing customer needs, these venues are stunning examples of contemporary venues which take advantage of their surrounding environments. But it’s not only just the newest most contemporary venues that were acknowledged at tonight’s awards. 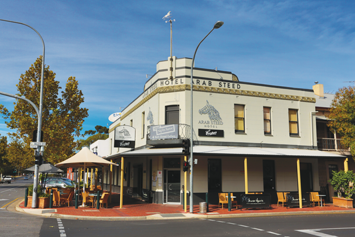 The 150 year old Victoria Hotel in Strathalbyn has taken out the award for the Best Bistro Causal Dining – Country. The judges were impressed with the large menu choice and use of many local products, and also its outstanding customer service. Steeped in history and charm, the Victoria Hotel embodies all that is great about country pubs and hospitality. The 2015 AHA|SA Hotel Industry Awards for Excellence was held on Tuesday, July 28, in The Arena, at the Adelaide Entertainment Centre. Over 800 people attended this premier industry event, with entertainment provided by Anthony Callea, and hosted by Hamish McLachlan. All winners from the AHA|SA Awards will now go on to compete in the National AHA Awards to be held in Brisbane on September 14, 2015. 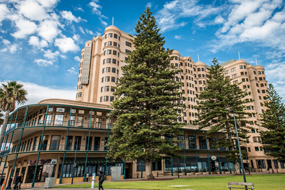 It's an icon of the Adelaide Beachfront and has now been renewed and revamped with an investment which shows strong intent for the future. Adelaide, meet the new and improved Stamford Grand.